Portland, Oregon. Congregation Beth Israel, 3rd building (1928). Exterior. Photo courtesy of Louis Davidson @ synagogues360.org. Portland, Oregon. Congregation Beth Israel, 3rd building (1928). Sanctuary. Photo courtesy of Louis Davidson @ synagogues360.org. (ISJM) While many historic American religious congregations, including synagogues, are having a hard time maintaining their buildings and especially raising funds to properly care for and restore stained glass windows, good news comes from Portland, Oregon, where Congregation Beth Israel (CBI) has begun an ambitious campaign to restore the windows in their 1928 Byzantine style sanctuary. The building was listed on the National Register of Historic Places in 1979 – one of the first synagogues so designated. Congregation Beth Israel, designed by Morris H. Whitehouse, Herman Brookman and Harry A. Herzog, is one of the grandest synagogues in the pacific Northwest, and one of the finest examples of the Byzantine style in the country. Built shortly before the onset of the Great Depression, the lavish building combines historicism with contemporary Art Deco motifs, and what was at the time modern design. 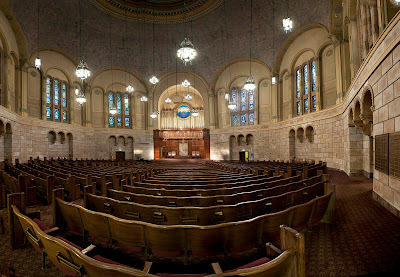 You can visit the sanctuary online through the photos of Louis Davidson at synagogues360.org. The eighteen tall windows around the sanctuary, grouped in triads, and the round window above the Ark, were designed by Albert Gerlach, chief designer for Portland's Fuller Studios. Gerlach was chosen for the job in 1926 after a “manufacturer's competition” resembling an architectural competition, but something unusual for choosing stained glass. Gerlach reportedly worked closely Henry Berkowitz, the congregation's rabbi beginning in 1928, in choosing the subject matter for the windows, which include days of the Creation, major festivals, biblical personalities and symbols of the tribes of Israel. Each window is 20 feet high and three feet widow, and taken together these complement the interior architectural articulation of applied elements and blind round-head arches, and they also echo the tall 4,500-pipes in Reuters organ. There is also a stained glass “corona” step at the apex of the great dome that surmounts the space. The windows add light and color to the great space. The restoration and repair of three of the eighteen windows began on Monday, May 20. The windows will spend the summer being restored. And will be re-installed for High Holy Days. Meanwhile, colored decals of the windows serve as place holders. This is the first phase of a multi-year project. Work has begun on the middle three windows on the south wall, which face Flanders Street. Following the general iconographic program, these depict Rosh Hashanah, the Tribes of Levi and Judah, and the Patriarch Jacob. This middle window is designated as the “Fellowship Window,” symbolized by the clasped hands in the lower portion of the panel. This was donated to the congregation by Trinity Episcopal Cathedral and St. Mary’s Cathedral. Plans are to complete the other two sets of long windows on the south side which sustain the most weather and are in urgent need of restoration, .over the next two years. The congregation's Building and Grounds Committee has been working for several years on a campus-wide inventory and maintenance plan, including recommendations for capital improvements. This is an exemplary undertaking, one that every congregation no matter how big or small, should begin. My own congregation – Temple Concord in Syracuse – is presently doing this for its buildings (for more information on how to organize such a work, feel free to contact me). Good planning is necessary for safety and security, and it also saves money in the long run. Congregation Beth Israel wisely maintains a building fund for maintenance. With a membership of close to 3,000 it is, of course, better positioned to do this than many smaller, poorer congregations. Still, it is important for all congregations – especially those with older buildings – to have some money in place for repairs and not have to always be forced to raise new money at a moment's notice. Fund raising for maintenance should be on-going part of the planning process. A CBI, the window restorations are made possible by a prior gift of $100,000 by Harold and Arlene Schnitzer’s to the restoration fund, and a bequest from Jack Neustadter. CBI, founded in 1858, is the oldest Jewish congregation in Oregon. In the late 19th century, its monumental two-towered (165 feet) synagogue at Twelfth and Southwest Main., erected in 1887, was one of the most prominent building on the Portland skyline. Portland, Oregon. Congregation Beth Israel, 2nd building, 1887. Sanctuary. Photo: postcard. The sanctuary seated 750 people and was the largest religious space in the city. Rabbi Stephen S. Wise presided from 1900 to 1906. This magnificent building burned down – due to arson - on December 29, 1923. This led to the design of construction of the present building – fortunately undertaken during the booming 1920s, when America was full of money and talented artistic and architectural designers and craftsman. The new synagogue at Northwest 19th and Flanders Streets seats 1,000, and was dedicated in April 1928. Instead of the two-tower design, preferred 19th-century,its is distinguished by its 100 foot Byzantine-inspired dome. Other contemporary "Byzantine" synagogues include Boston's Ohabei Shalom, Chicago's Temple Isaiah and Detroit's Shaaray Zedek. In 1948 the congregation erected the Sherman Education Center, opposite the Temple which was then expanded in 1994. 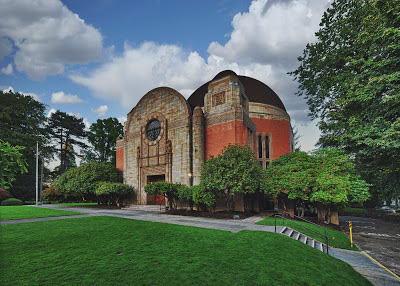 In 1993, the Schnitzer Family Center, which includes a chapel, was dedicated to provide more classroom, office, and meeting space. Lowenstein, Steven. The Jews of Oregon. Portland: Jewish Historical Society of Oregon, 1987. Temple Beth Israel. Temple Beth Israel: A Temple for the Ages. Portland: Temple Beth Israel, 2002. I am sad to report the death of Prof. Yom Tov Assis (1942-2013), Professor of Medieval Jewish History at the Hebrew University, Jerusalem. Born in Aleppo, Prof. Assis settled in Israel in 1971 where he became a leading scholar of Hispanic Jewry and also a popular academic tour guide. His deeply researched and documented historical articles about Jews in medieval Spain will remain essential reading for generations. Though best known as a political and economic historian, his 1992 article "Synagogues in Medieval Spain," in Jewish Art remains an essential go-to reference for anyone wanting to understand the role of medieval synagogues in Spain. Typical of Assis's work, it is both erudite and accessible. In this work, he showed the valuable role of responsa literature in our identifying and understanding forgotten synagogue buildings and the culture around them. His many important books include The Golden Age of Aragonese Jewry: Community and Society in the Crown of Aragon, 1213-1327 and Jewish Economy in the Medieval Crown of Aragon (1213-1327), Money and Power. The complete results of the documentation of the Weissensee Jewish cemetery in Berlin have been published as 115.628 Berliners. The Weißensee Jewish Cemetery – Documentation of the Comprehensive Survey of the Burial Sites (Berlin, 2013). The entire text is provided in German and English. Click here for a downloadable PDF of the full publication. Also — see the presentation on this documentation given by Tobias Rütenik at the conference on Managing Jewish Immovable Heritage held in Krakow April 23-25.